From the a la carte menu, we also tried the salmon dish (£9), a dish for which Adam won British Chef of the Year in 2014. Consisting of fennel cured salmon, sweet and sour wasabi with pea pannacotta, snow peas and dill oil, I loved the freshness of the salmon, and the combination with the snow peas and dill oil. However I found the sweet and sour wasabi slightly overpowering against the flavour of the salmon and would have preferred less of it for better balance in the dish. We also tried the BBQ veal tartare (£10), chilli and herbs from the a la carte menu. This was another favourite. Finely chopped and tender, the veal was abundant in flavour and held up well to the balanced use of chilli and herbs. Moving back to the mains in the tasting menu, the celeriac, with truffle, egg yolk, apple and dates was staggeringly good, even if the seasoning was a little strong. 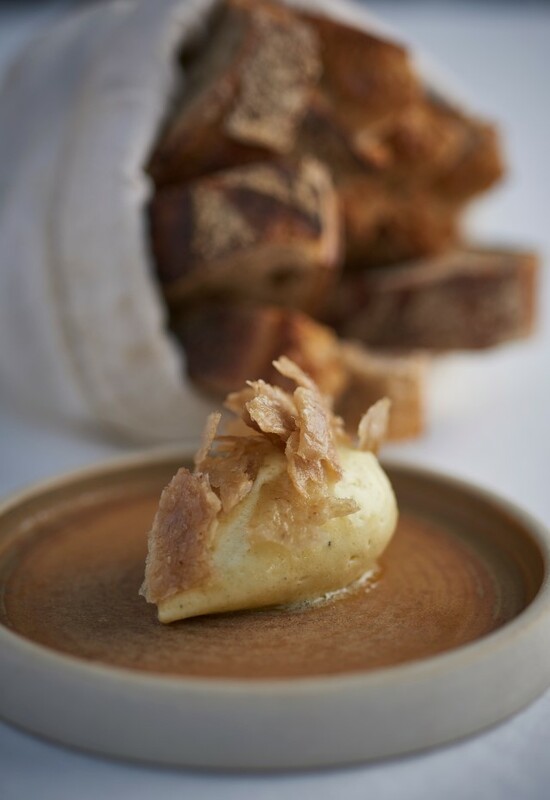 The contrast between the thinly sliced celeriac, laced with delicious truffle, and placed over a creamy, ever so slightly set egg yolk and sweet pieces of diced apple produced a glorious contrast of textures and flavours. The cooking of a roasted hake in the next dish was perfect, with fish that was perfectly moist and soft. This was served with some lovely potato mousseline, a fragrant crab sauce which matched the hake perfectly and some interesting crispy potatoes with seaweed and vinegar. Roast veal was also nicely cooked and was accompanied by some sour cream, different types of garlic, pickled onions, burnt onion powder. Everything combined wonderfully for a satisfying eating experience. 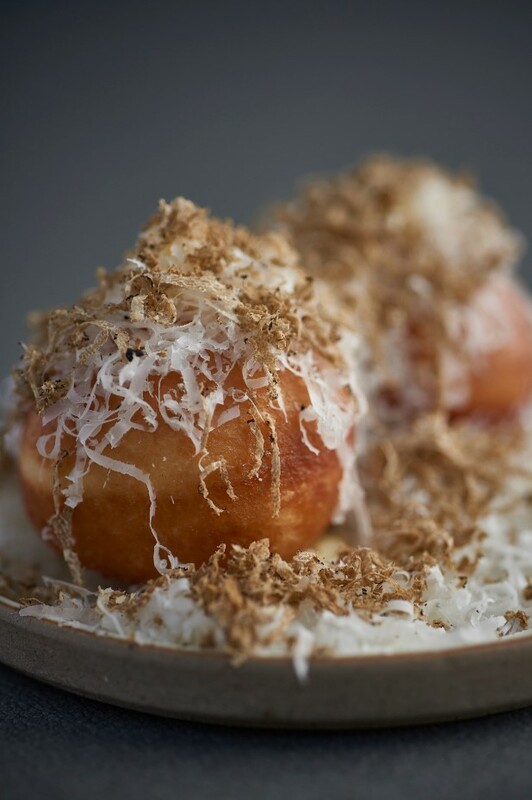 Cheese doughnuts with truffle (£4 supplement) consisted of choux pasty stuffed with a runny cheesy filling and topped with grated parmesan and truffle. This was ever so delicious – rich and ever so slightly gooey and rather moreish. 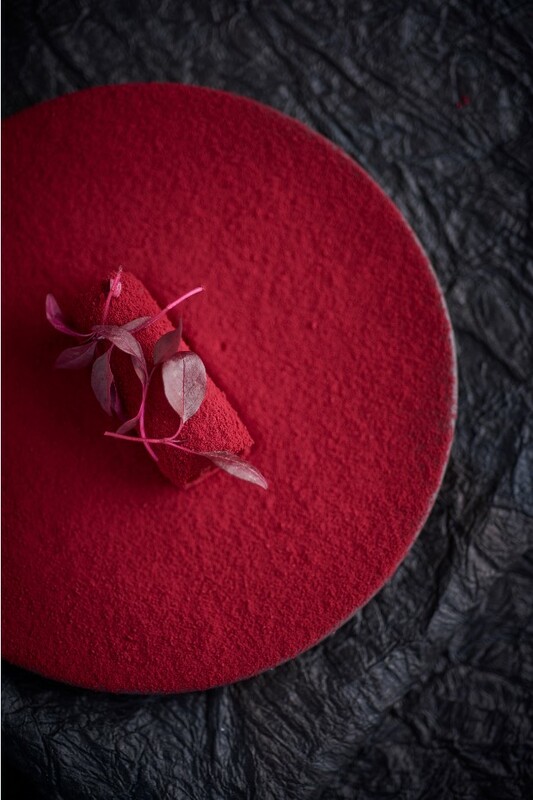 Beetroot, beetroot and more beetroot may divide opinions but I was enthralled by the combination of beetroot panna cotta with pickled and roasted beetroot in the middle, covered in beetroot powder as it provided an eclectic contrast of textures, all with a beetroot flavour. Presentation wise, the rolled beetroot was quite arresting as well. The dessert selection offered a choice of three, including a “Heston-styled” molecular gastronomic “nitro” tiramisu. Effectively a deconstructed tiramisu rather than a traditional representation of the Italian classic, this proved to be a theatrical spectacle. Nitrogen frozen chocolate was poured over the tiramisu at the table which started to dissolve the dessert of rich, gooey chocolate and a biscuit base. A tasty and well-constructed affair. Drinks wise, there is a diverse selection with draft beers being prominent on the menu. 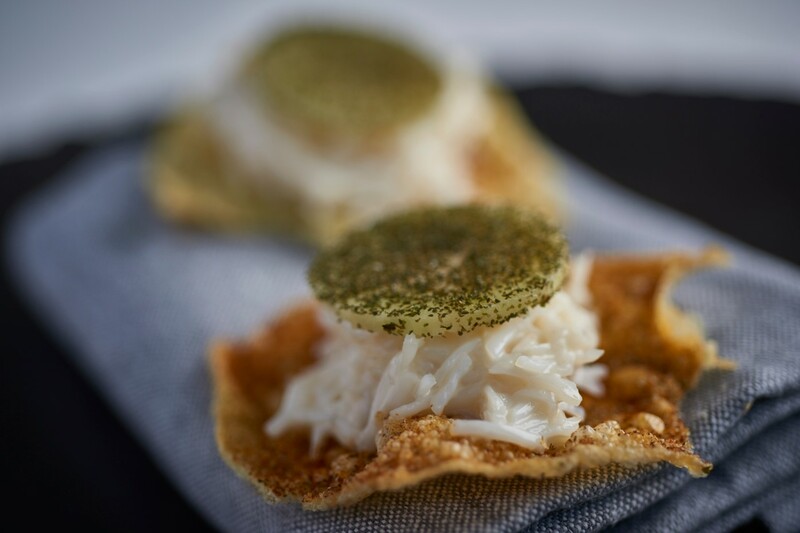 The tasting menu also comes with the option of matched wine or beer. 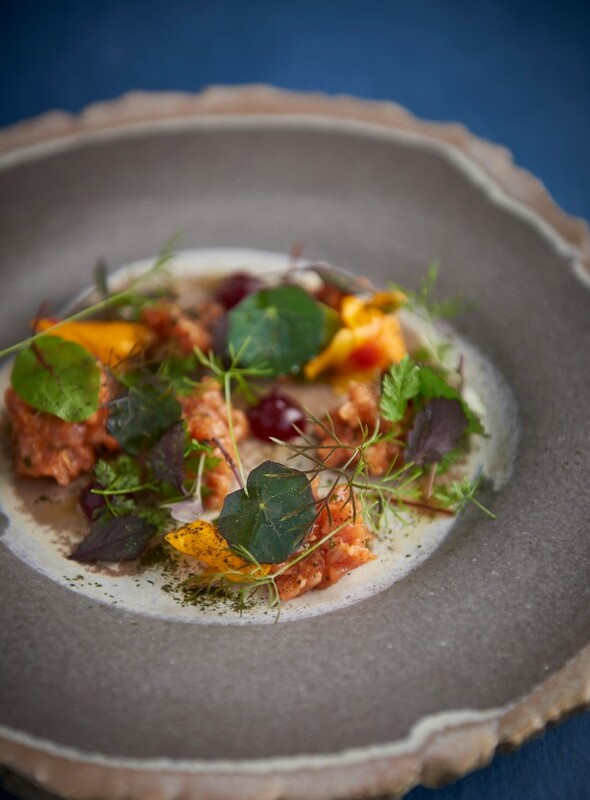 With The Frog, Adam Handling shows off a dazzling array of influences and skills. Its high end cooking meshed with molecular techniques sprinkled with dashes of Japanese influences. It’s pure ambition on a plate. 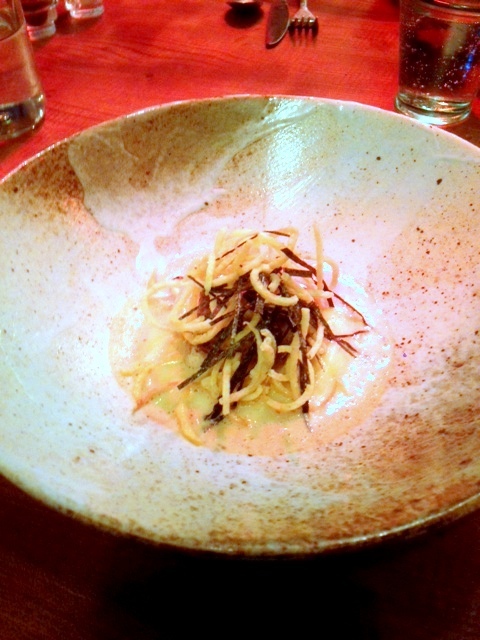 For the most part I adored the food and admired the techniques on show. And at £45, I found the food to be good value. And the menu was very on point with current dining trends, what with a variety of tasting sharing plates for those who prefer to dine in such a way. But I found the concept of The Frog itself to be a little confusing. The casual décor would suggest that the food should have been just as causal, but it wasn’t. It’s almost as if the setting was far too laid-back to really support this level of smart cooking. That said the food alone is worth a visit to The Frog. Note: I dined as a guest of The Frog. 2) The beef tartare canape. 2) For me, the decor was at odds with the standard of the food. Prices: about £30 to £40 a head. The tasting menu is £45 a head. Excludes drinks and service.